Racket Brands. Sale On Now! 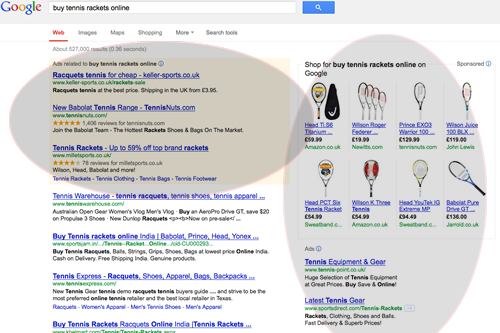 The advert will show between the light yellow box at the top of Google searches and the adverts displayed down the right hand side. Your position is is determined by the amount you are willing to bid and the popularity or “Click Through rates” Part 2 explains more about “Click Through rates” and bids. We will also talk about pro’s and cons and what not to do.